A frenectomy is simply the removal of a frenum in the mouth. A frenum is a fold of tissue that passes from the movable lip or cheek to the gum. There are multiple frenums within the mouth, the most prominent being the ones in the front of the upper and lower teeth. When a frenum is positioned in such a way as to interfere with the normal alignment of teeth or results in pulling away of the gum from the tooth surface causing recession, they require repositioning with a simple, single surgical procedure. Frenectomies are simple procedures that when necessary help promote long term health of the gums and teeth. 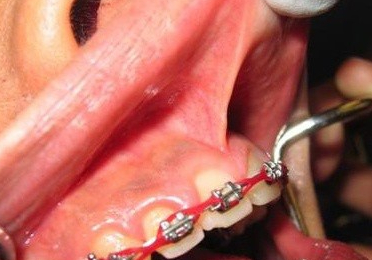 They can also prevent orthodontic tooth relapse following orthodontic treatment. The removal of the lingual frenum, which is under the tongue, is called a lingual frenectomy. A lingual frenectomy is often performed for patients who are “tongue-tied”. Immediately after this minor oral surgery, the tongue has increased mobility and can extend out of the mouth. This procedure can help improve speech and promote proper tooth arch development in growing children. The labial frenum often attaches to the center of the upper lip between the two front teeth. This can cause a gap or space and result in gum recession due to the frenum pulling the gums away from the teeth. A labial frenectomy removes the labial frenum. This procedure is often performed on orthodontic patients to assist in closing the gap or space between the two front teeth. Laser frenectomy procedures can be performed at Dr. Wiland’s periodontal offices in Indianapolis, Kokomo and Richmond, IN. To schedule a consultation, or to learn more about this condition, call 317-888-3322 today. Bruce B. Wiland, DDS, MSD is board certified in the specialty of periodontics which includes the placement of dental implants. Other services include laser periodontal therapy, esthetic tissue contouring and nonsurgical treatment. Sedation is always available to relieve apprehension.